Shopping at Coles I noticed an interesting occurrence in the canned fish aisle. A complete lack of Greenseas tuna. 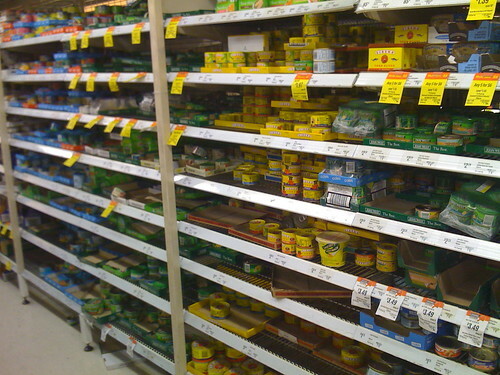 While there seemed to be an abundance of John West tuna, as well as Coles tuna, and that yellow one Sirena. There were no tins of Greenseas tuna. Not even a space on the shelf where they should be stacked my the night’s shelf refillers. Is there a problem between Coles and Greenseas at the moment? Perhaps it is just that Coles got feed up with being number 2 on the tuna sustainability index [1, 2, 3] by GreenPeace ? This entry was posted in Photos, Shopping and tagged Coles, photo, Shopping, supermarket, tuna. Bookmark the permalink. What is going on I have brought Greenseas Tuna for years and now all of a sudden it has disappeared from the shelves. Can someone enlighten me as to why this product is no longer available. Just recieved email saying that coles is no longer selling greenseas (also on their website), could there be a reason? like they sold dolphin meat or something?